Preschool Playbook: What is This? This past Sunday we had a family gathering for my father's birthday. We're all goofing around, having a good time, then my brothers start coming up to me. They all want to know what my youngest is sitting on the swing creating. So I go over and take a look--not a clue! So I sit down on the swing with him and watch and talk to him, finally I have to come out and ask: So, what do you do with that? And to my amazement it makes perfect sense and I must tell you I was quite impressed. What is it? From his mouth, "A marble maze." I have even had the pleasure of playing with this myself for a while. There is no specific beginning or end, but it's fun moving the marble around. 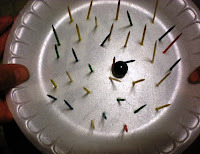 I thought if you were interested, you're little one might enjoy making one of these. I had no hand in the project. All credit goes completely to my youngest. 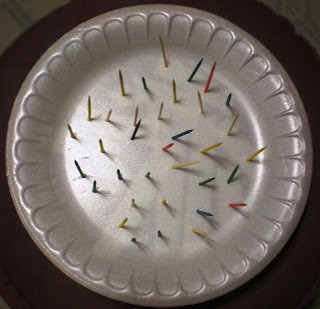 Give your child a plate and let them poke as many toothpicks through the plate. 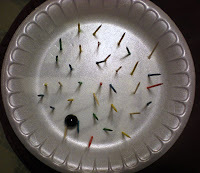 Add a marble and have some fun! It's amazing what kids come up with. That is so cool! Very creative! I would have never thought of that =) Aren't children creative! Creative genius must run in the family!